San Juan de la Maguana, 15 de enero. 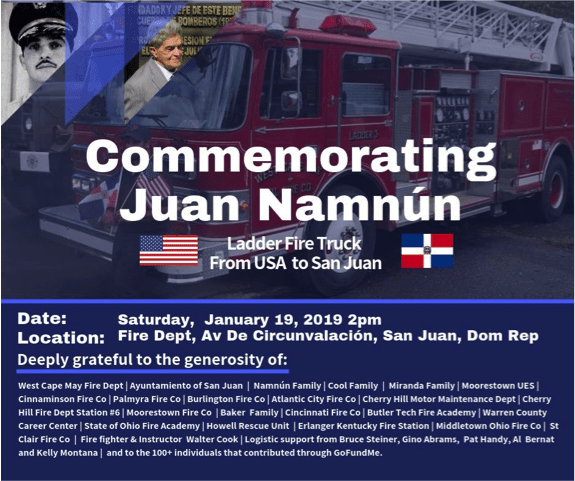 Con el objetivo de recordar el legado de Juan A. Namnún Yilbe hacia el Departamento de Bomberos de San Juan de la Maguana, este sábado 19 de enero la familia del Coronel Fundador del Cuerpo de Bomberos de San Juan de la Maguana entregará en República Dominicana un Pierce Aerial 105 camión de bomberos de escaleras, valorado en más de $150,000 USD, el cual será una herramienta indispensable al momento de atender las emergencias de rescate en dicha ciudad. El evento contará con la presencia de la alcaldesa de la ciudad, Arq. Hanoy Sánchez Salgado, el director de CIUBEN, Nicolás Núñez y el presidente de la Sala Capitular, Ezequiel Montilla, tal como Juan A. Namnún, Verónica Namnún Cool, hijos del Coronel Namnún que viajaran de Estados Unidos a conmemorar el legado de su Padre son una placa durante la ceremonia. 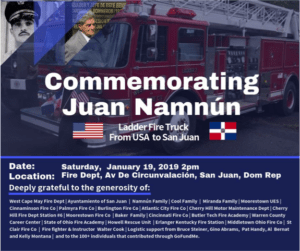 La iniciativa de donar un camión de bomberos a la ciudad de San Juan nace de la familia de Don Juan luego de su muerte en agosto del 2018 para honrar su tremenda contribución al pueblo y al país. Inmediatamente los hijos y la esposa del Coronel Fundador del Cuerpo de Bomberos iniciaron una campana que motivó a diversas organizaciones y amigos de la familia a colaborar en esta noble causa. Después de solo 3 meses alcanzaron la meta necesaria para brindar a San Juan de la Maguana un moderno camión de bomberos, capaz de atender las necesidades de no solo la provincia, si no la región también. Encima del Camión, los esfuerzos resultaron en una colecta de herramientas que lleno un contén de 20 pies, incluyendo chalecos, botas, guantes, mascaras, camillas, y más. Servicios también fueron donados incluyendo pruebas de seguridad, servicios logísticos, mercadeo y trasportación. “Don Juan Namnún ha sido mi inspiración durante mi trabajo como bombero en San Juan de la Maguana. Fue el quién consiguió el primer camión de bomberos para la ciudad; su entusiasmo y liderazgo hizo que se incorporarán y prepararan brigadas femeninas de bomberos, además de trabajar de la mano con los jóvenes. Juan Namnún, fue un hombre que dio la oportunidad a otros integrantes del cuerpo de bomberos para seguir creciendo y aprendiendo¨, expresó Víctor Michelen Rodríguez, jefe del Cuerpo de Bomberos de San Juan de la Maguana. 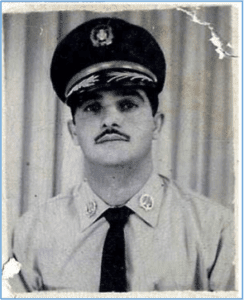 Cabe destacar que Coronel Namnún se inició como bombero en San Juan en 1951, fundando el Departamento de Bomberos en dicha ciudad, y a la vez siendo el Primer Bombero en su localidad. 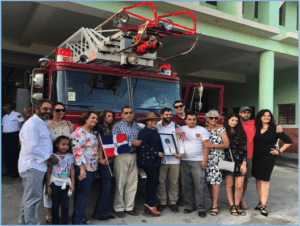 Don Juan trabajó cómo bombero hasta 1974, llegando a ser fundador y coronel del Cuerpo de Bomberos de San Juan de la Maguana en República Dominicana. De acuerdo con su esposa María Angelina Namnún, Don Juan era una persona que vivía ayudando a los demás. ¨Por ejemplo, si ocurría un desborde de río, el salía inmediatamente para cubrir la emergencia y llevar asistencia a las personas que estaban damnificadas. Siempre mostró amor por su comunidad, su familia, su trabajo y por sus compañeros bomberos. Fue una persona que sabía cómo ayudar a los demás¨. Finalmente, esta acción no hubiese sido posible sin la ayuda y la colaboración de las siguientes organizaciones: West Cape May Fire Dept, Ayuntamiento de San Juan, Familia Namnún, Familia Cool, Familia Miranda, Moorestown UES, Cinnaminson Fire Co, Palmyra Fire Co, Atlantic City Fire Co, Cherry Hill Motor Maintenance Dept, Cherry Hill Fire Dept Station #6, Butler Tech Fire Academy, Warren County Career Center, State of Ohio Fire Academy, Howell Rescue Unit, Erlanger Kentucky Fire Station, Middletown Ohio Fire Co, St. Clair Fire Co, Bombero Walter Cook, Apoyo logístico de Bruce Steiner, Gino Abrams, Pat Bernat, Kelly Montana, y más de 100 personas que contribuyeron a través de GoFundMe. BETHESDA, MARYLAND, SEPTEMBER 15, 2018 – Karina and Katherine Vidal, founders of Citiskopes, won the 3rd Latino Innovators’ Pitch, a competition that gives entrepreneurs the opportunity to pitch their business concept, new product or idea to a panel of judges for seed funding, mentoring support and business counsel. The Latino Innovators Pitch kicks off Hispanic Heritage Month in the region. The Vidal sisters, of Dominican heritage, created Citiskopes, a things-to-do platform enhanced by augmented reality for audiences that want to travel like a local with experiences that provide a unique perspective only found in a destination of choice. “Citiskopes is a brilliant concept that marries augmented reality, technology, and travel,” said Veronica Cool, CEO, Cool & Associates LLC. Cool & Associates LLC presented the winning team a $5,000 check on September 4 during the 16th annual Maryland Hispanic Business Conference, the premier annual gathering for Hispanic business owners, entrepreneurs, executive and job seekers. The innovative and entrepreneurial sister team competed against five finalists for the prize. Citiskopes’ founders envisioned not an experiential platform for locals and tourists but also a forum to provide exposure to entrepreneurs’ events, activities and experiences to help thrive local economies. 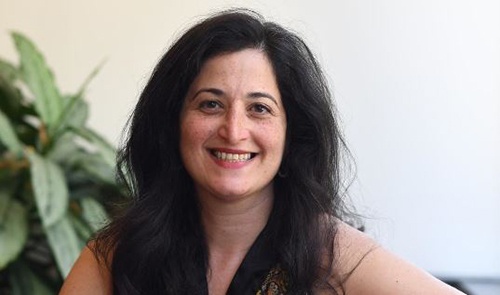 “As a result of the award, we will now have the ability to expand our company through mentorship, networking and through the seed-funding,” said Katherine Vidal, co-founder, Citiskopes. “It was an honor and a privilege to be a judge for this year’s wildly successful Latino Innovator’s Pitch competition, said Theresa Daytner, CEO, Daytner Construction Group. “All of the Latino entrepreneurs had three things in common: strong storytelling, passion and measurable impact. 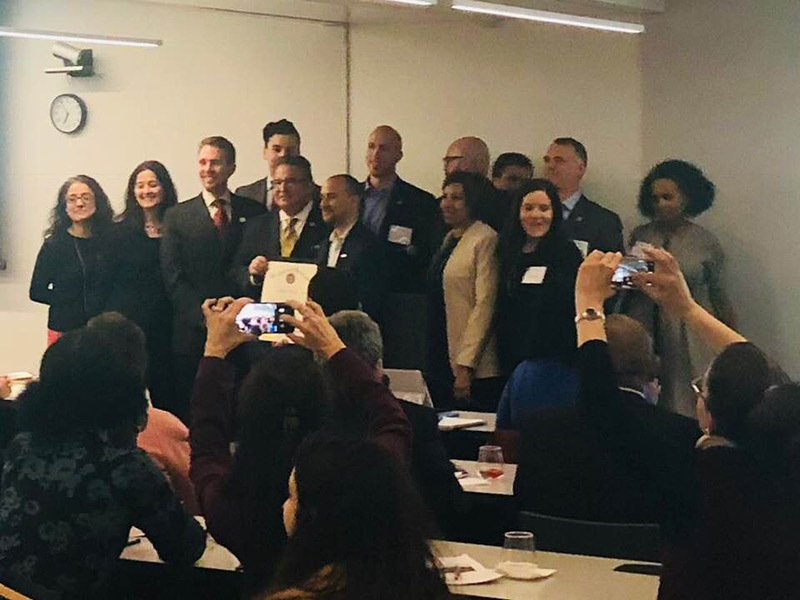 I was thoroughly wowed by caliber of applicants this year.” Additional judges included Tracey Edwards, Washington Suburban Sanitary Commission; Sean Dunphy, Wells Fargo; Karina Mendoza, Latino Economic Development Center; and Joe Morales, Morales Law Firm. Maryland is home to more than 57,000 Hispanic businesses. With Hispanics establishing businesses at 15 times the national average, Veronica Cool, CEO, Cool & Associates LLC, established the Pitch competition in 2015 to highlight the impact, talent and diversity of Hispanic businesses in both industry and scope. 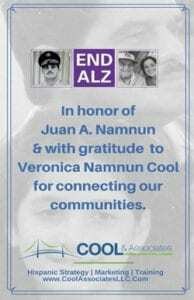 Cool & Associates LLC helps corporations, nonprofits and government agencies effectively tap our nation’s robust Hispanic market. The firm provides essential tools and services for clients such as marketing and communications, outreach campaigns, training and staffing support, diversity & inclusion workshops, and other customized solutions to engage Hispanic businesses, customers, donors and students. C&A is a certified MBE firm, woman and Hispanic owned, proudly working to help clients penetrate the fastest growing segment of the population: Hispanics! Hispanic Heritage Month is commemorated September 15-October 15, leverage our Hispanic Heritage Toolkit to increase engagement with your employees, customers and community! 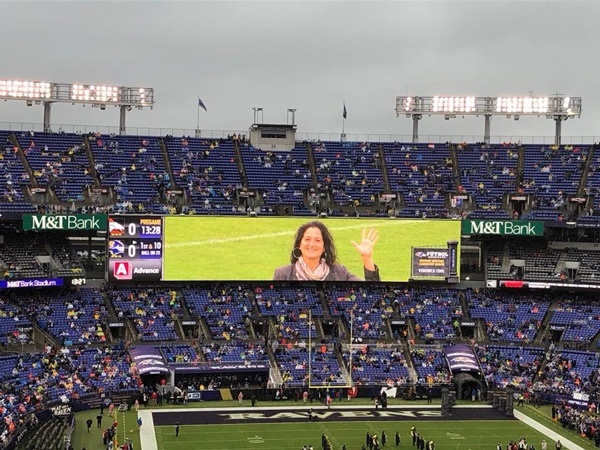 BALTIMORE (June 2018)—Veronica Cool, founder and CEO of Cool & Associates, LLC, was honored this month by the Baltimore Business Journal (BBJ) as one of nine 2018 Leaders in Diversity. 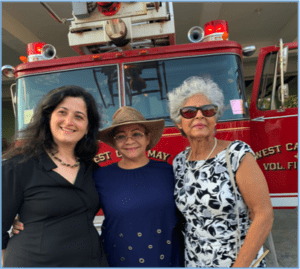 With Hispanic residents making up 9.5 percent of the Maryland population, Cool helps companies and nonprofits reach out and connect in meaningful ways to this often-untapped pool of potential customers, partners, and employees. Cool & Associates offers inclusion-centered plans at a time when the growing Hispanic population contributes an estimated $1.7 trillion to the US economy. The company operates with the understanding that authentic connections through culture and language can create enhanced engagement. The process can be complex with much to consider. Latinos come from more than twenty countries, each one with its own political beliefs, history, and values. Cool and her team help businesses and organizations make effective decisions by arming them with facts about the Hispanic market. Maryland’s Hispanic population, for example, prioritizes economic stability, jobs, and education while diligently adapting technology and staying active on social media and mobile devices. The Dominican Republic native was working in financial services and business banking when she first noted the need for a comprehensive process to facilitate the connection of the American mainstream and Hispanic cultures. 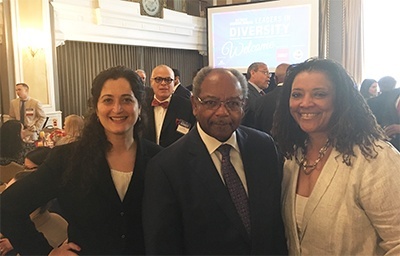 “I’m humbled to be recognized as an inaugural Leaders in Diversity honoree by the BBJ and for being able to build bridges between our richly interconnected cultures,” she said. Cool is one of three BBJ honorees with connections to the Open Society Institute (OSI) of Baltimore. Also honored were fellow board member Eddie Brown, who is the founder, chairman, and CEO of Brown Capital Management; and Pamela King, who serves as the director of community fellowships and initiatives for the OSI. About Cool & Associates: The firm offers an integrated suite of services to support organizations, including public, private, philanthropic, and small businesses, in engaging Spanish-speakers and Hispanics as customers and employees. The award-winning team, comprised of experienced bilingual folks of varied cultures, offers Hispanic engagement strategy, language services, and assistance with marketing, media, and public relations, along with support in workforce training and talent development. We peel back the curtain to unveil exactly how we built our multi-million dollar businesses and grew our influence and social impact on OUR own terms. Bill will be speaking on the Hispanic Opportunity- because this population is your client and employee – your voter, student, patient.. This is the biggest untapped market! For this exclusive 5-day event, you don’t have to spend thousands of dollars on airfare to fly out since this incredible event will take place ONLINE. So you can tune in from the comfort of your couch, on the treadmill, over lunch, or wherever you find yourself during the work week. 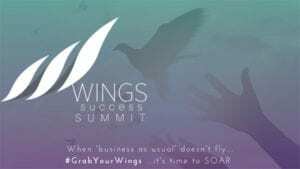 Get the details and register TODAY for the WINGS of Success Summit here. The future is bright in #MyBmore because we are taking care of the present! 1 in 6 people today is Latino. 1 in 5 millennial is Latino. 1 in 4 kindergarten is Latino. Thanks to Baltimore Gas & Electric and Constellation for spearheading this movement!